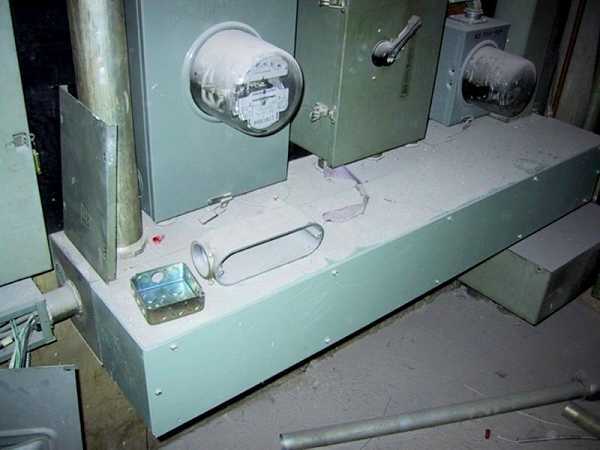 Register Log In ECN Forum Forums Photos for General Discussion An Equipment Room Violation? Does this installation violate any particular 2002 NEC rule? Dont know the article off hand but the trough is sticking out way to far. Looks to me like it was ok at one point. I bet it was extended when the meter to the left was added, which I might think is a better solution to getting the taps to fit than usung the old hammer and 2X4 trick! 2002 NEC 110.26(A)(3) Height of Working Space. the electrical equipment shall be permitted to extend not more than 150 mm (6 in.) beyond the front of the electrical equipment. That looks like a gutter screwed onto the face of another gutter. They must have cut the back out of it as I have never seen a 'gutter extention.' I can't think of a section to quote of hand but I imagine it would be a listing violation if nothing else. I could be wrong. We could cite 90.7 because the wireway (equipment) may have been altered, and we probably could find something in the metal wireway article.